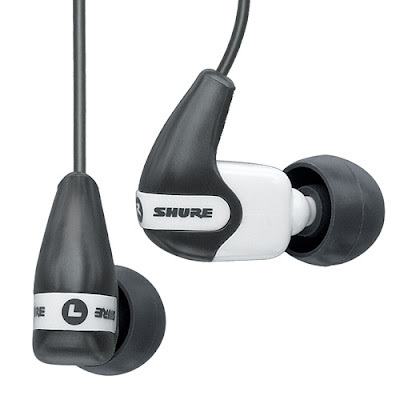 When I bought my Shure E2c earphones two years ago, I was blown away by the sound quality. I never spend more than $50 for earphones before and after buying the E2c model I would never consider downgrading to anything less. Shure really knows how to create addictive high quality products. The quality of the sound produced by my old E2c earphones was so good that I had to get rid of some albums that I ripped into mp3s long time ago when hard drive space was measured in megabytes rather than in gigabytes. After two years of slave-like everyday service my Shure E2c earphones started to show signs of wear and it became apparent that they were going to retire soon. Afraid of being without a good pair of earphones during my upcoming transatlantic flight, I got a new pair of Shure SE210. The design has change slightly compared to the older model, but it still preserves the main features that I loved so much. I've been listening to some music via these earphones for only an hour or so, but I can already tell that SE210 brings "great sound" to a brand new level. I don't consider myself to be an audiophile, but even my untrained ear can hear the big difference between the two. The new pair fits better as well as feels more comfortable in my ears. It's a progressive disease my friend. Soon your curiosity will gain the upper hand... Bwahahahah! I had the same ones E2c and I was very disappointed at the end. Not by the quality of sound but by the fact that they fall apart in 6 months. I know that I use headphones a lot, but expected more. I use them a lot for running but wires have a tendency to tangle that makes them tricky to place in ears. Then a friend of mine recommended me: Sennheiser CX300 which are so far much better. Quality is the same but price is lower. I haven't tried Sennheiser yet, but at the moment I don't have a good reason to look for anything else :-). Looking at the pricetage at amazon, the price difference isn't big. Actually I got the E2c pair for something like $70 during Apple's Black Friday deal two years ago and I also got 30% off the SE210 at Apple this year. I must say that AKG totally rocked my world in a headphone kind of way. They are expensive but i found a good deal on ebay. and 501 and 601 are pretty good too. I own a pair of Ultimate Ears Super.fi 5EB (Extended Bass) from Amazon. The earphones are rather pricey but I got it at a discount. With all the good comments for Ultimate Ears Triple.fi 10 Pro, I do hope I could own one, but they are far too expenive. Im actually looking for something balance, maybe your recommendation on Shure SE210 will be a good choice.